Here is your chance to get introduced to the world of PaddleFit and its training program through our fun and challenging introductory fitness class. We will give you a taste of the many benefits of training on the water that includes: board skills, balance, endurance, strength, and focus. Now is the time to start on your path to get on the water and achieve your training goals. This class is designed to accommodate all skill levels but participants must have prior SUP experience. 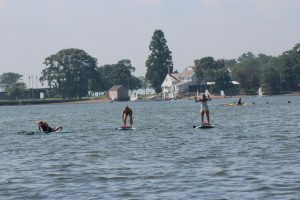 PaddleFit Intro is required prior to taking SUP Fitness. Please click here for the latest PaddleFit Intro classes. Registration is now open. All participants must register at the Front Desk. No online registration is available for this class.